How to install and use Piezography ink on the 7900, and 9900. Use of flush cartridges with the SC-Pxxxx Printers. Normally the use of flush cartridges is suggested and recommended when switching to Piezography inks from a non-Epson or non-Piezography ink set, or if you have been experiencing clogging problems with your current ink set. Otherwise, the actual Piezography inks can be used to "flush" out the pre-existing color inks from your printer. Because of the limited supply of expensive 1-time chips we are currently recommending that you do a straight switch from Color Ink to Piezography ink on these printer models. We will update this page with more relevant workflow information when we have a good Piezoflush workflow figured out for this model printer. If you do not use flush carts, you may need to print some additional media before all traces of color ink have been removed. The yellow position is where the lightest shade 7 (Light Grey Warm) is installed. 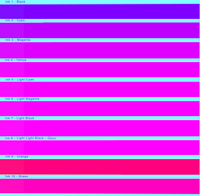 Shade 5 which is darker is installed in the light magenta position. On very old printers which will have deposits of color pigments in the dampers, a yellow and magenta cast in the highlights and 1/4 tones will be present for awhile without the use of flush carts. So weigh the costs of flushing with PiezoFlush (which will easily get rid of old pigments) or flushing with or printing out with Piezography ink to eliminate the initial color cast. Important Notes: In order to run an initial fill cycle, your new cartridges must each be at least 30% full. If they are less than 30% full, the printer will not allow you to continue until you replace those cartridges determined to be too empty to proceed. Once beginning an initial fill cycle, there is no way to abort it, and so your printer will be waiting for you to replace those cartridges it instructs you to install. If your Piezography cartridges are new, they will be full, but if they have been used in the past, removed, and you are now in the process of reinstalling them, you need to know how full they are before you go forward with the procedure. If you are not sure how full your Piezography cartridges are, install them and turn the printer on normally. The ink status monitor will display the ink levels. If they are not all at least 30% full, refill with ink and reset chips to read full (do NOT reset chips on carts that are less than full, because you can risk running the cart empty and getting air in your ink system). Additionally, during this procedure, your maintenance tank may fill up, requiring you to replace it. If your maintenance tank is partially filled, it is a good idea to have a spare on hand. Maintenance tanks are available from Epson ink retailers, or you can follow our instructions for reusing them. We recommend using the Epson Service Adjustment Software. 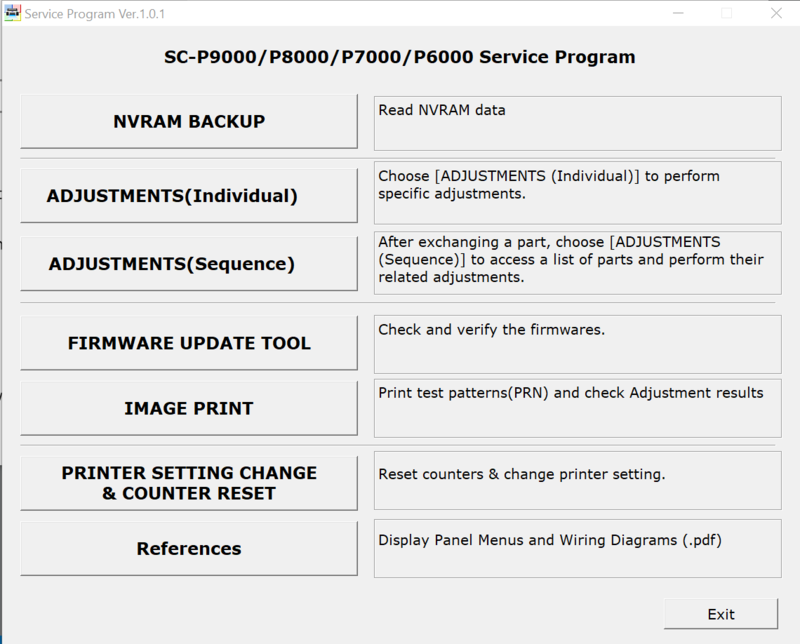 This software may be available from many sources, but we find it convenient that this website offers these software utilities and also Epson printer Service Manuals: 2manuals.com The cost is reasonable. It provides all of the functions that an Epson repair technician would use to adjust your printer. It runs only on Windows, but we use it by running Windows on top of Parallels for Mac. This is Ink Change Procedure A immediately following this section. We do not recommend running 6-15 heavy cleaning cycles – so we will not give an instruction to do so. This is easily figured out. But, we believe that it will not remove residual stain in an efficient manner. Using a special Purging Target with QTR Calibration mode should replace the inks after printing about 40-50 square feet per channel and that method is Ink Change Procedure B. Click here for B. Remove the Epson ink cartridges and replace with the Piezography filled SC-P cartridges. The cartridges must be filled according to the chart at the bottom of this document. 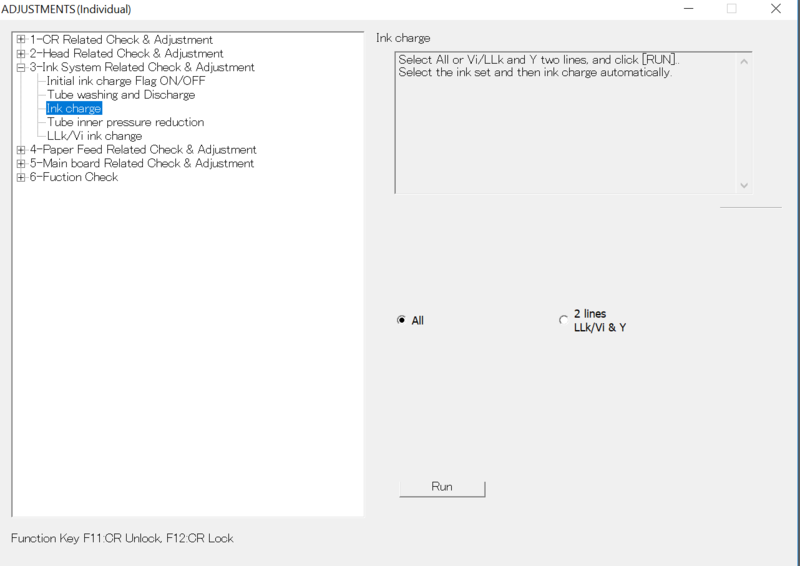 Launch the Epson Service Adjustment Software and click on the ADJUSTMENTS(Individual). Click on Ink Charge on the Ink System Menu. In the Ink Charge screen click on the RUN button. The printer will now perform the original ink initialization. It takes several minutes. Between 15ml and 45ml of ink in each position will be charged through the system. Do not interrupt the printer or system. You will see a confirmation that the ink charge has been completed when it is finished. From this same window you can perform head cleanings and nozzle checks. You may wish to do so. However, if you can not get a clean nozzle check within 3 tries. Allow the printer to settle down for several hours. You can use the regular Epson utility software or the printer’s maintenance menu to perform nozzle checks and head cleans. Verify that you have a perfect nozzle check pattern before printing images. 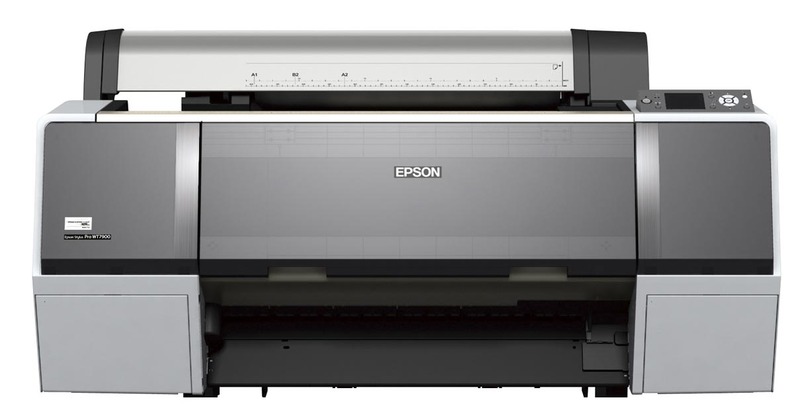 The Epson Pro 7900 and 9900 series 24" and 44" wide printers have the unique ability to print with 10 channels along with auto-switching MK/PK inks enabling 11 total inks loaded into the printer. These printers supports Gloss and Matte K7 printing with two spare channels in case the print-head starts to die. These printers also support dual-k5 Piezography Pro ink (introduced in late 2016). We suggest anyone buying an Epson 7900/9900 get an extended warrenty for this printer. Be prepared to replace the damper assembly and cleaning assembly every 2 years. As luck would have it, Piezography ink clogs this printer significantly less than Epson OEM ink due to a smaller and more uniform nano-particle size! *We are not publishing K7 curves for this printer combo. We are migrating people over to the more adaptable P2/K6 configurations. Use 7900-9900-PiezoDN curve folder for digital negatives with this ink set.